Vaira Vike-Freiberga was honoured with the "Knight of Freedom" award for many of her merits, such as the promotion of democratic values throughout the world, fighting for equality of women, as well as efforts for social justice. Vaira was born in 1937 in Riga. As a seven year old girl in 1944 she fled from the burning ship after the bombing of the Latvian port of Liepaja. With her mother and stepfather a few years wandered around the refugee camps in Germany to finally get to Canada. Always fascinated with the culture of her homeland – has written hundreds of articles about Latvia, Latvian Association organized emigration. In the autumn of 1998. She was appointed director of the newly created Latvian Institute in Riga. 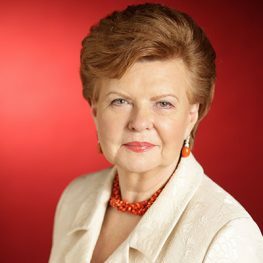 In June of 1999 Vaira was elected president by the Parliament of the state and thus was the first president – a woman in Eastern Europe as well as the second president of the Baltic states derived from emigration.